Did ISIS carry out mass executions before withdrawing last weekend? The Islamic State has been accused of killing at least 90 people in the town of Qaryatayn in eastern Syria, recaptured by pro-Assad forces last weekend. Homs Province Governor Talal Barazi said, “More than 60 were dead, while more than 100 others are missing, either kidnapped or killed.” He claimed those killed were public employees and pensioners with their families. Other unconfirmed claims put the toll at 128. Those slain were accused of collaborating with the Assad regime and its forces. 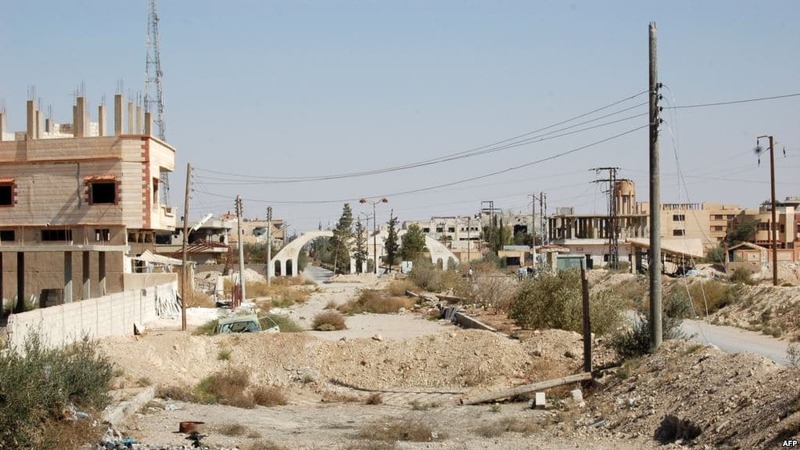 The town has changed hands on several occasions throughout the Syrian conflict. It was overrun by the Islamic State in August 2015, as the group took much of Homs Province including the ancient city of Palmyra. Many civilians left and settled either in the opposition-controlled north or in the Rukban refugee camp on the border with Jordan. In April 2016, when Qaryatayn was occupied by pro-Assad forces, residents were prevented from returning on the basis that they were supporting rebels. Eventually the regime agreed that 20,000 civilians could return. ISIS regained the desert town three weeks ago in a sudden counter-attack against pro-Assad forces who had driven into Deir ez-Zor Province, taking some of the Islamic State’s last major positions in Syria. ISIS pulled out of Qaryatayn on Saturday as they fell back on their final areas of Deir ez-Zor. Opposition media activists of East Ghouta near Damascus have appealed for aid to reach the area. We see children wasting away before our very eyes every day. We see our elderly and ailing suffering pain while being unable to find medicine or relief. We see heart-breaking scenes of people searching for food. And finally, we rescue our wounded and bury our dead from the land and aerial bombardment that continues to target our cities and towns. General Wael Zizafoun has been assassinated, days after he took over the regime command in eastern Syria from his slain predecessor, the iconic General Issam Zahreddine. No one has claimed responsibility for Zizafoun’s killing. Instead, the sudden events have spurred conspiracy theories, including one — spread by the outlet linked to Lebanese Prime Minister Saad Hariri — that both Zahreddine and Zizafoun were killed in an internal feud between the Assad regime and its key ally, Lebanon’s Hezbollah. Zahreddine died last week near Deir ez-Zor city when his car was struck by an Islamic State explosive. The general was involved in mass killings early in the Syrian conflict near Damascus and oversaw operations that destroyed much of Homs city, but he was renowned for his command of regime forces holding out against a three-year ISIS siege on Deir ez-Zor which was broken this summer. Who Killed Civilians in Airstrike on Deir ez-Zor? Regime media has said that 14 people were killed by an airstrike on Monday on the divided city of Deir ez-Zor in eastern Syria — but opposition outlets say it was a regime warplane that carried out the bombing. Syrian State TV accused the US-led coalition of the attack, which it said wounded 32 people. Local sources said at least 22 people were killed, but did not attribute responsibility. A Deir ez-Zor 24 correspondent said regime forces imposed a security corridor on the struck area and preventing civilians from approaching or filming, while confiscating phones. US warplanes are supporting the Kurdish-led Syrian Democratic Forces as they advance against ISIS outside the city. The fight inside the city is between pro-Assad forces and the Islamic State. Coalition spokesman Colonel Ryan Dillon said he would check the reports, but added that there was no reason to strike targets in the city because the SDF is not fighting there.